Which one of these two statements is false? Which one you choose as false depends on whose interpretation of vegetable self-sufficiency you lean towards: the Ministry of Agriculture’s triumphant announcements of ever higher vegetable tonnage, or the data on crop quantities combined with current population and dietary needs (as I do here). My answer is that the second of the two statements is nearly true whereas the first is entirely false. This is the explanation, and it is based on the data using which the startling graphic presented above was drawn. In its ‘First Advance Estimates of Horticulture Crops’ for 2017-18, the Ministry of Agriculture has said that a record quantity of 180 million tons of vegetables has been cultivated. This is no doubt a quantity record for vegetables. It apparently exceeds by a wide margin the quantity required to adequately provide all our households with vegetables for their daily meals. How many household would that be? My calculation, based on the projected increases in population and household contained in Census 2011, is about 270 million (or 27 crore) households in 2018, and with the mean size of the household being 4.8 members. Such a typical household needs about 1.44 kilograms per day of vegetables as part of a well-balanced diet. Adjusting for the smaller portions eaten by children (up to 14 or 15 years old) and the elderly (from about 65 years old) and further adjusting for the losses and waste that take place from the time vegetables are brought to mandis till they cooked in kitchens, a total of about 144 million tons is needed to supply all our households for a year. With 180 million tons cultivated and 144 million tons needed, we seem to have a surplus of some 36 million tons of vegetables. Not so. This ‘surplus’ needs closer examination, which the chart guides you towards. As you see, the biggest circles belong to five vegetable categories: potato, tomato, other vegetables, onion, and brinjal. What these biggest circles represent needs to be connected to what the National Institute of Nutrition has recommended as the required daily quantities of vegetables. And that is, not just 300 grams per day, but 50 grams of green leafy vegetables, 100 grams of roots and tubers and 150 grams of other vegetables. A household consuming the stipulated 1.44 kg/day of vegetables if those vegetables are a kilo of potatoes and 440 grams of tomatoes is not a household eating vegetables – it’s a household eating far too many potatoes and tomatoes. The chart shows us dramatically how unbalanced the cultivation of vegetables has become in India. 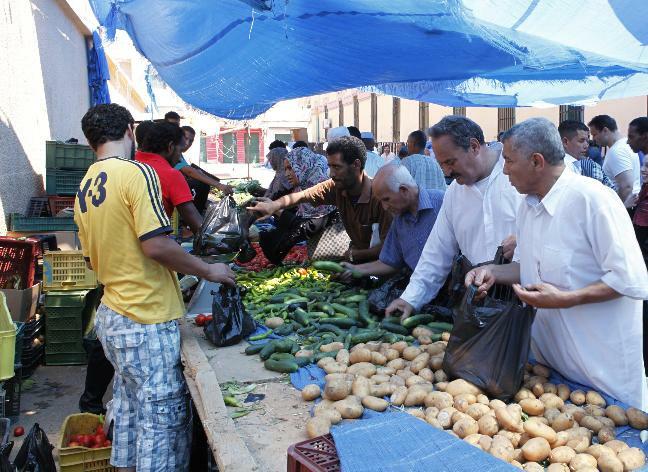 Nearly 40% of the total cultivated is onions and potatoes (70 mt). Add tomatoes and the three account for 51% of the total (93 mt). Add brinjal and the four account for 58% of the total (105 mt). Our 270 million households should be buying, cooking and eating about 95 million tons of vegetables that are green and leafy, or are ‘other vegetables’. But in these two categories, we are growing no more than about 75 mt – which reveals a massive shortfall of 20 million tons. This is the truth behind the tale of booming, record vegetable production. Those five big circles in the chart should never have been the sizes they are. Our households do not need an allocation of 500 grams of potatoes per day (no, Lays, Pringles, Doritos, Kurkure, Uncle Chipps, Bingo, Haldirams chips and wafers are not food). What we need instead is for every taluka, tehsil, block and mandal to value and grow its local varieties of leafy greens, roots and tubers, shoots and stems, edible flowers and buds. That is what will bring back genuine vegetable nutrition and diversity. 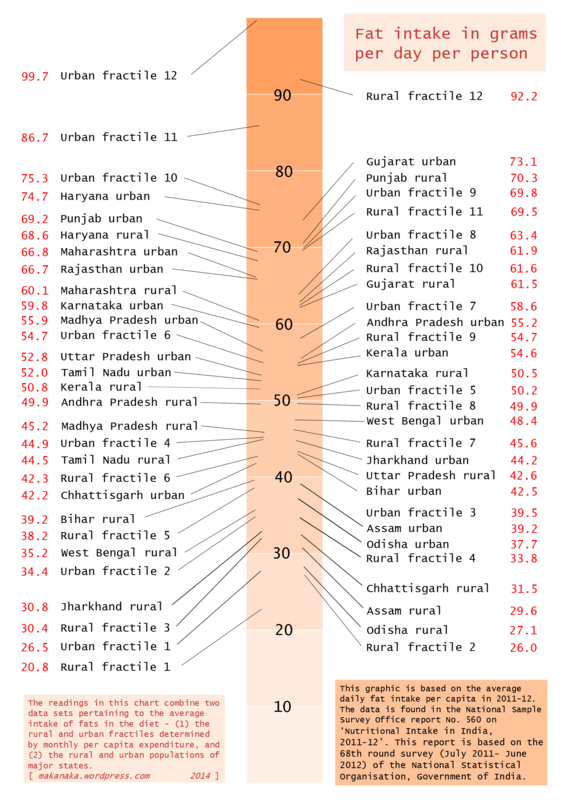 This rather nice infographic (all our own work) shows the variation in average fat intake per capita across fractile classes of monthly per capita expenditure (MPCE) at the all-India level for the rural and urban populations. It also shows the variation in fat intake between rural and urban populations of 17 major states. We find that the average fat intake for India was about 46gm per rural person per day and 58gm per urban person per day (in 2011-12). But averages hide a great deal, and our intriguing fat-finding meter brings out, with alarming clarity, the (somewhat greasy) details. This graphic is based on the average daily fat intake per capita in 2011-12. The data is found in the National Sample Survey Office report No. 560 on ‘Nutritional Intake in India, 2011-12’. This report is based on the 68th round survey (July 2011 to June 2012) of the National Statistical Organisation, Government of India. The NSS report found that the 10th and 11th rural population fractiles consume twice as much fat per day as those in the 3rd rural fractile class (members of a fractile numbered lower spend less per month than members of those numbered higher). Likewise, the 8th and 9th urban population fractiles consume 1.5 times as much fat per day as those in the 3rd and 4th urban fractile classes. There is much variation between the fat intake by rural populations of states. In both rural and urban, per capita intake was lowest in Odisha (rural: 27.1gm; urban: 37.7gm) and Assam (rural: 29.6gm; urban: 39.2gm). The states with highest fat intake were Haryana (rural: 68.6gm; urban: 74.7gm), Gujarat (rural: 61.5gm; urban: 73.1gm) and Punjab (rural: 70.3gm; urban: 69.2gm). But the NSS report found that the increase in fat intake per capita with the rise in MPCE level is steeper than the corresponding increase for protein intake (we will link this finding with a forthcoming infographic). Per capita fat intake in the top fractile class of the urban sector was about 100gm, more than three times that in the lowest fractile class (about 27gm), while in the rural sector the intake of the top fractile class, at 92gm, was more than four times higher than that of the bottom class (21gm). fractile class is never less than 7.5gm. The history of consumer price indices for pulses in India’s ordinary shops and bazaars since 2006 January is one of five periods. The first, from 2006 January to 2008 June, is of a rise in some pulse foods, a decline in a few, and little movement in others. The second period is one of a rise in concert from 2008 June to 2010 January, some pulse foods rising very steeply and not others – whole moong did but not whole urad, masur dal did but peas did not, horse gram did but not rajmah. The third period, from 2010 February to 2011 August, is an overall lowering of the price indices for almost all pulse foods. 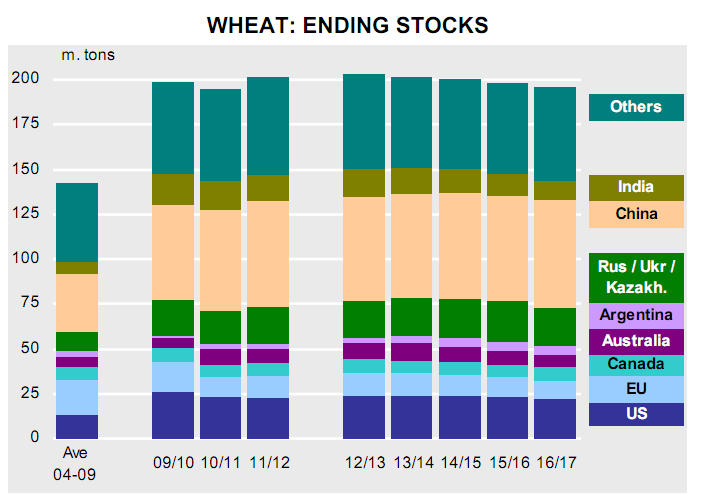 This happened when the general food price index rose quickly and stayed high – but pulses remained relatively unaffected. That insulation, the fourth period, didn’t last long, from 2011 September till around 2012 May (even shorter for some pulse foods). The fifth period began around 2011 July for some pulses, and two months later for others, and is continuing. This is a period of volatility in the price indices of the pulses group to an extent not seen in the previous seven years – peas rises but not gram, horse gram and rajmah shot up but raungi and white gram dipped, whole masur and whole moong soared while besan fell and papad remained flat. The data I have taken from the monthly itemised retail consumer price indices, weighed to be all-India, for industrial workers with their base of 100 being in 2001, and compiled by the Labour Bureau, Ministry of Labour and Employment, Government of India. 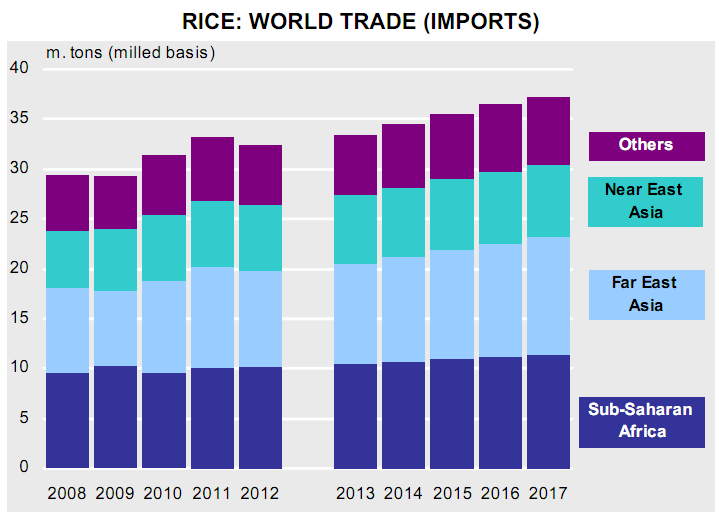 At the end of the second quarter of 2014, the spread of price index values for the pulses group of our staple foods is wider than at any time in the last eight years. It is this food group that provides the nutritional balance and is a culturally rich source of protein in everyday meals and popular home-made snacks. 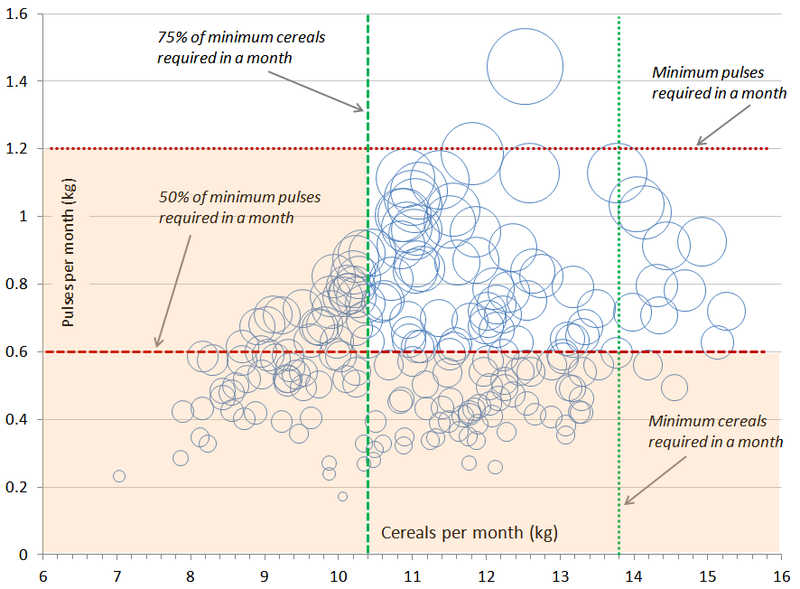 The overall price rise these charts graphically illustrate, and the uncertainty about their availability (which is what the recent volatility of the individual index lines show) are evidence of the threat to the nutritional security of many millions of rural and urban households in India. 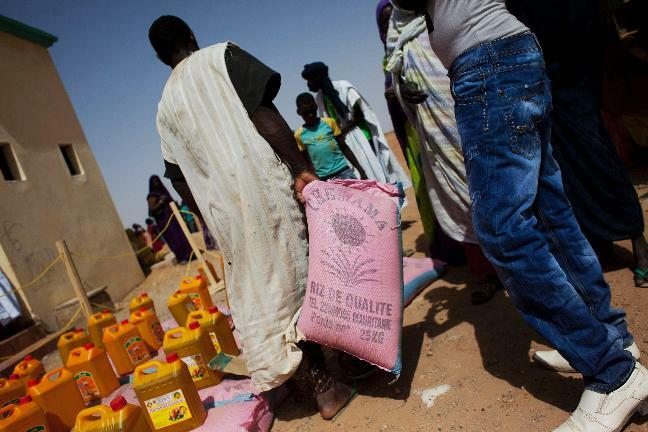 For the last few years, food scarcity and the effects of industrial food have co-existed, often within the same demographic circle and within countries. This is no contradiction (although it demands far more attentive food policy) because the in the world’s industrialised agriculture and processed food system, both must exist in order that profits are made, in order that ‘economic growth’ is fulfilled. Now, the BBC has reported that the number of overweight and obese adults in the ‘developing world’ (an unnecessary hangover that label, which media organisations must outlaw) has almost quadrupled to around one billion since 1980. The BBC report is based on a study by Britain’s Overseas Development Institute, which has said that one in three people worldwide was now overweight – the study uses these findings to urge governments to do more to influence diets. There has indeed been a dramatic increase in the numbers of overweight or obese people in the past 30 years, as anyone who has passed through public places is likely to have observed. Previously considered a problem in richer countries, the biggest rises are in what those familiar with ‘development economics’ (another term that means effectively nothing) call ‘middle income countries’ and the ‘developing world’. The ODI study, called ‘Future Diets’, has traced how the changes in diet – more fat, more meat, more sugar and bigger portions (what the Americans loving call ‘supersize’) – have led to a health crisis. It also looks at how policy-makers have tried to curb these excesses, usually with little success. The official line on the causes of obesity includes higher incomes. The rationale is that those households which earn more are now able to choose the kind of foods they want, and that they choose poorly. Changes in lifestyle are mentioned, as is the increasing availability of processed foods, the dreadful impact of advertising in and on every space discernible by our senses, and the co-option of media by the food industry (along with most other consumerist industries that require propaganda to ensure quarterly profit and expectations are met and that shareholder value is protected). But this is the very alarming result. In what are also called ’emerging economies’, where a large middle class of people with rising incomes lives in urban centres and takes less physical exercise than their parents and grandparents did, there is “an explosion in overweight and obesity in the past 30 years” which of course will lead to serious implications for public health. The consumption of fat, salt and sugar has increased globally according to the United Nations, and these increases are significant factors in the increase seen in cardiovascular disease, diabetes and some cancers. The study has recommended more concerted public health measures from governments, similar to those taken to limit smoking in developed countries, but of course, to really bring about a change in the way new entrants into the urban middle classes eat, there must be the admission that economic ‘growth’ should first stop, then reverse. How likely is that in the next generation? 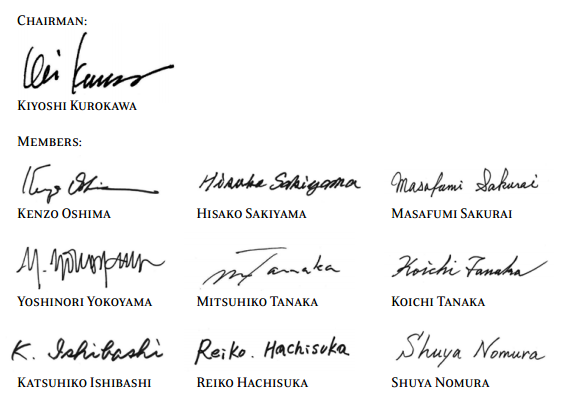 Japan has found new heroism and it is in the form of the ten members of the first independent commission chartered by the Diet in the history of Japan’s constitutional government. 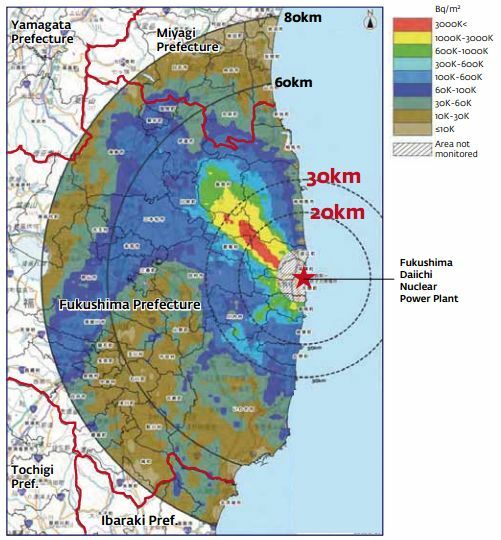 Their report, ‘The official report of The Fukushima Nuclear Accident Independent Investigation Commission’, has come as a powerful call for the abandonment of nuclear power in Japan and indeed worldwide. The voluminous report was designed from the start along lines wholly and utterly ignored by the subjects of the report – the government of Japan and the Japanese nuclear power industry (and also, by association, the international nuclear mongers). And that is the maximum degree of information disclosure. To achieve this, all 19 of the commission meetings were open to public observation and broadcast on the internet (except the first one), simultaneously in Japanese and English, to a total of 800,000 viewers. The commission also also used social media, Facebook and Twitter to communicate with the public, receiving over 170,000 comments. To gain a global perspective, the commission dispatched three teams overseas, and included interviews and hearings with experts from the USA, France, Russia, Ukraine and Belarus. These ten members have shown the determination to achieve maximum information disclosure in a culture, and against unfathomable pressure, that is determined otherwise. They have posed the toughest questions possible and drawn out, from hundreds of responses, the strands of truth about Japanese society which have since 2011 March 11 been obscured by the scale of the disaster, the Tohoku earthquake and tsunami, and the massive, tragic loss of life. These ten members have emphasised through their doggedness and their untiring pursuit of the truth, no matter how bitter, that it is of vital importance that their work – this report – be utilised, as they have said, “for the Japanese people and for the people of the world”. They have demanded that national pride be set aside if it obstructs the truth, and for this, they symbolise a heroism Japan has, in an hour of unprecedented public outrage, rediscovered. They are Kiyoshi Kurokawa (chairman) and members Kenzo Oshima, Hisako Sakiyama, Masafumi Sakurai, Yoshinori Yokoyama, Mitsuhiko Tanaka, Koichi Tanaka, Katsuhiko Ishibashi, Reiko Hachisuka and Shuya Nomura. We must salute them. “The earthquake and tsunami of March 11, 2011 were natural disasters of a magnitude that shocked the entire world. Although triggered by these cataclysmic events, the subsequent accident at the Fukushima Daiichi Nuclear Power Plant cannot be regarded as a natural disaster. It was a profoundly manmade disaster – that could and should have been foreseen and prevented. And its effects could have been mitigated by a more effective human response. “How could such an accident occur in Japan, a nation that takes such great pride in its global reputation for excellence in engineering and technology? This Commission believes the Japanese people – and the global community – deserve a full, honest and transparent answer to this question. “Our report catalogues a multitude of errors and willful negligence that left the Fukushima plant unprepared for the events of March 11. And it examines serious deficiencies in the response to the accident by TEPCO, regulators and the government. For all the extensive detail it provides, what this report cannot fully convey – especially to a global audience – is the mindset that supported the negligence behind this disaster. What must be admitted – very painfully – is that this was a disaster “Made in Japan”. Its fundamental causes are to be found in the ingrained conventions of Japanese culture: our reflexive obedience; our reluctance to question authority; our devotion to ‘sticking with the program’; our groupism; and our insularity. Had other Japanese been in the shoes of those who bear responsibility for this accident, the result may well have been the same. “Following the 1970s “oil shocks,” Japan accelerated the development of nuclear power in an effort to achieve national energy security. As such, it was embraced as a policy goal by government and business alike, and pursued with the same single-minded determination that drove Japan’s postwar economic miracle. With such a powerful mandate, nuclear power became an unstoppable force, immune to scrutiny by civil society. Its regulation was entrusted to the same government bureaucracy responsible for its promotion. At a time when Japan’s self-confidence was soaring, a tightly knit elite with enormous financial resources had diminishing regard for anything ‘not invented here’. “This conceit was reinforced by the collective mindset of Japanese bureaucracy, by which the first duty of any individual bureaucrat is to defend the interests of his organization. Carried to an extreme, this led bureaucrats to put organizational interests ahead of their paramount duty to protect public safety. Only by grasping this mindset can one understand how Japan’s nuclear industry managed to avoid absorbing the critical lessons learned from Three Mile Island and Chernobyl; and how it became accepted practice to resist regulatory pressure and cover up small-scale accidents. It was this mindset that led to the disaster at the Fukushima Daiichi Nuclear Plant. “This report singles out numerous individuals and organizations for harsh criticism, but the goal is not—and should not be—to lay blame. The goal must be to learn from this disaster, and reflect deeply on its fundamental causes, in order to ensure that it is never repeated. Many of the lessons relate to policies and procedures, but the most important is one upon which each and every Japanese citizen should reflect very deeply. The consequences of negligence at Fukushima stand out as catastrophic, but the mindset that supported it can be found across Japan. In recognizing that fact, each of us should reflect on our responsibility as individuals in a democratic society. There is no case at all for humans to continue eating the amount of meat they do. In what are commonly called ‘industrialised’ countries (a category that includes most of the OECD countries) the share of meat in total food consumption is around 48% and has been so for several decades (has in fact been so once the overhang of the food shortages of the Second World War wore off, and particularly after the emergence of Europe’s common agricultural policy, which ushered in a change in that part of the world which was as far-reaching in its consequences as was the Green Revolution in South Asia). 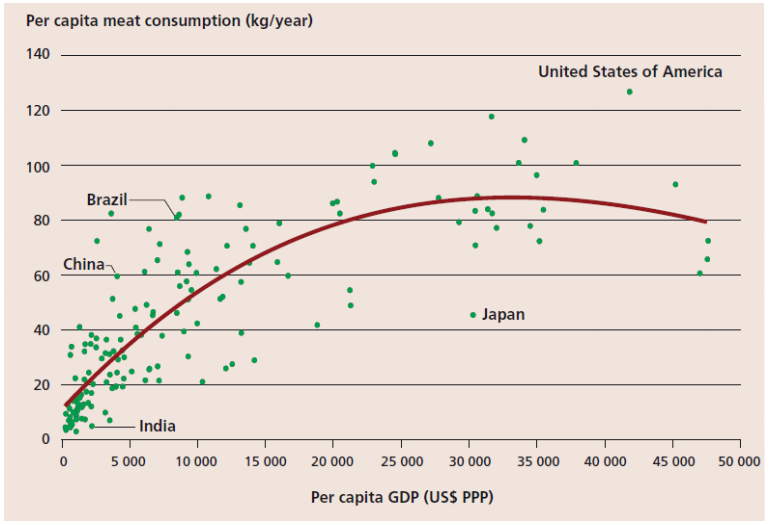 Now we see more clearly that as per capita food consumption has increased it has been accompanied by (those ‘market forces’ at work, the industrialisation of agriculture and the disinheritance from local choices for the average consumer, both by connected design) a change in dietary patterns that can only be described as catastrophic. Those who look at this change from an economic standpoint call it ‘structural’, for we have seen the diets of people in ‘developing’ (forgive the use of this term, so misleading it is, especially when the ‘developed’ world’s ravenous greed for resources turns these very concepts grotesquely on their heads) being altered. 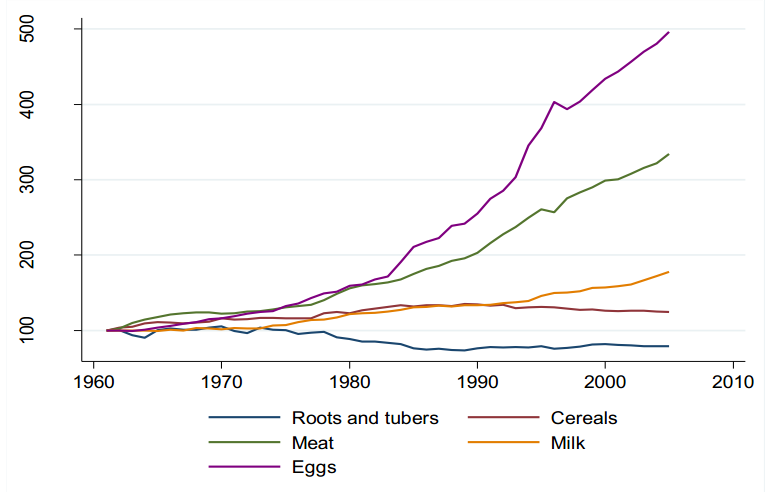 In the South, for these peoples (some of them newly urbanised and whose activities contribute to the growing inequality of incomes – one has only to look at oddly swelling Gini curves to see this), there has been a rapid increases of livestock products (meat, milk, eggs), vegetable oils and, to a smaller extent, sugar, as sources of food energy. These three food groups together now provide 29% of total food consumption (also often called “dietary energy supply”) and this proportion has risen from 20% only three decades ago. Mind, these are not small increases over more than a generation – as a first look at this change will seem to imply. A single percentage point increase over a generation for a country’s population places a very large burden on land, water, crop growing patterns and of course health. It is the prognosis that I find chilling. 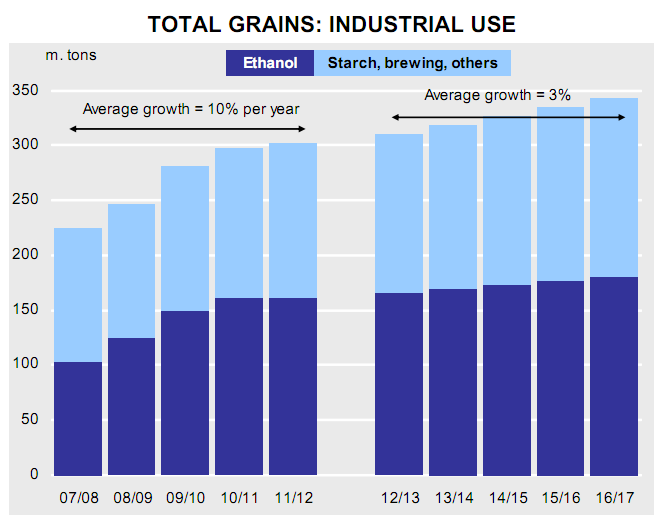 The FAO has rather unemotionally remarked that this share is projected to rise further to 35% in 2030 and to 37% in 2050. Can civilisation (let’s assume we can call this human imprint on the planet a single civilisation of a homogenous species although we all know it isn’t, not by any stretch of the fertile imaginations of our tens of thousands of indigenous peoples) tolerate such a shift in how people feed themselves. No, certainly not, the impact is catastrophic already. There are libraries of evidence to show that demand for livestock products has considerably increased since the early 1960s in the ‘developing’ countries. India, for example, so staunchly vegetarian through its struggle for freedom and through the leisurely years till economic ‘liberalisation’ strengthened its grip on minds and alimentary canals alike, is home to a very large and rapidly growing poultry industry (how quickly the vocabulary turns upon the rational, when did harmonious domestication and the organic circling of the nutrient cycle turn into an ‘industry’, banishing animals from their roles in our ecosystems?) and a fisheries ‘industry’ that has depleted the Arabian Sea (it is the Mer d’Oman from the other side) and the Bay of Bengal of their creatures both demersal and pelagic. Thus we are confronted by the spectres of consumption of food which is attached, like a motor-car engine is to its crankshaft, to growth-by-magnitude. 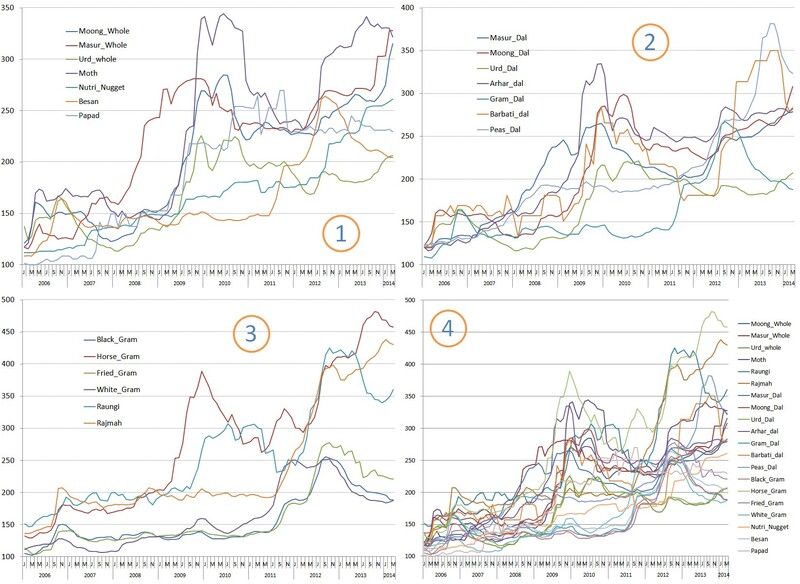 In the ‘developing’ South, the consumption of milk per capita has almost doubled (recall Operation Flood in India), meat consumption more than tripled and egg consumption increased by a factor of five (recall the National Egg Coordination Committee and its catchy jingle: “Meri jaan, meri jaan, murgi ke ande khana“). And yet, it is not yet South Asia – for the most substantial growth in per capita consumption of livestock products has occurred in East and Southeast Asia. China, in particular, has seen per capita consumption of meat quadruple, consumption of milk increase tenfold, and egg consumption increase eightfold between 1980 and 2005. And yet again, among the developing-country regions, only sub-Saharan Africa has seen a modest decline in per capita consumption of both meat and milk (according to FAO). Where will this lead to? Into what zone of rolling disaster will the pursuit of the animal protein take our land-water-crop-habitat balance, already so precarious and already on a knife’s edge? The estimates (all bland, all unemotional, as if unable or unwilling to emote the reality to come) are that such demand is set to increase significantly towards 2050 because of population growth and continuing change of dietary patterns. 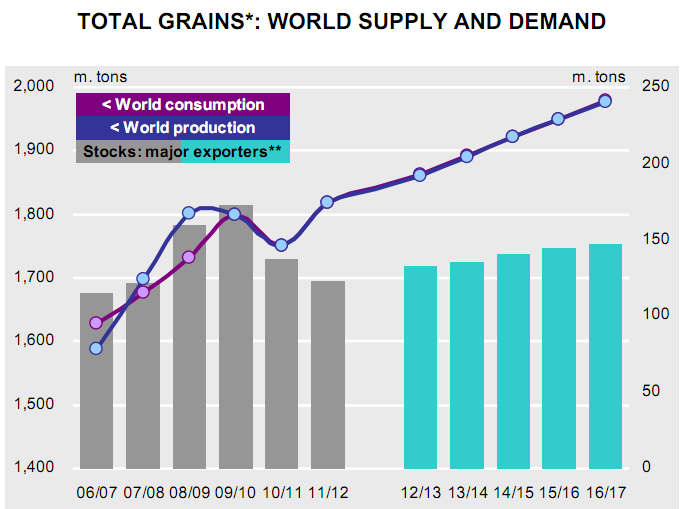 The forecasts ought to be seen as terrifying: according to FAO’s estimates, an increase in the consumption of livestock products will cause a 553 million tons increase in the demand for feed, which represents half of the total demand increase for coarse grain between 2000 and 2050. 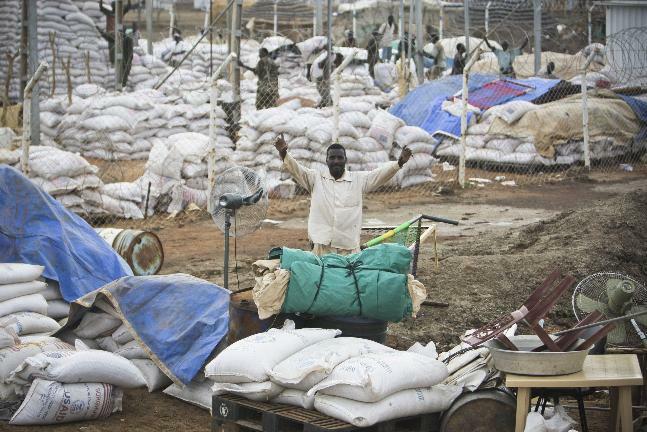 The FAO’s regiments of agro-economists and trend watchers have said that income growth in low-income countries and emerging economies will drive demand even higher (the Foresight 2011 report has said so too). They concur that there will be a shift to “high-status and non-seasonal foods, including more meat consumption, particularly in countries with rising income” (ah yes, the rising income, the fata morgana of a tide that lifts all boats, as the development banks have long wanted us to believe). No, comrades, it is not so – Nature does not recognise your balance-sheet.